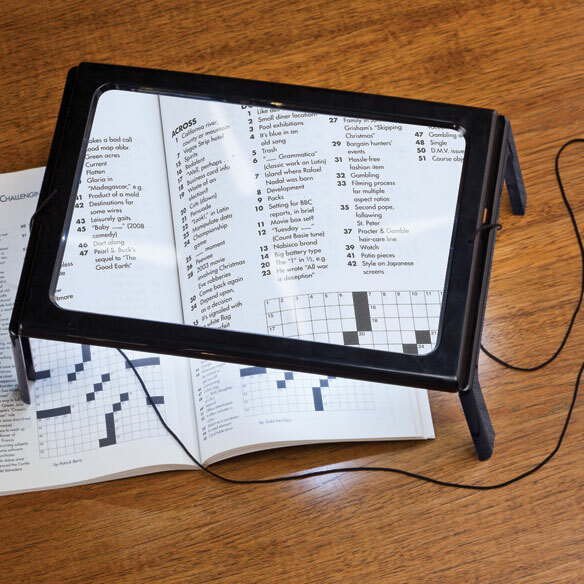 Lighted stand magnifier helps you see and leaves hands free. Versatile, lighted 3X lighted magnifier can be used 3 ways: Hang by the attached neck strap, extend its 4" folding legs or lay it flat. Weighs 0.45 lbs. 4 LEDs illuminate your surface. 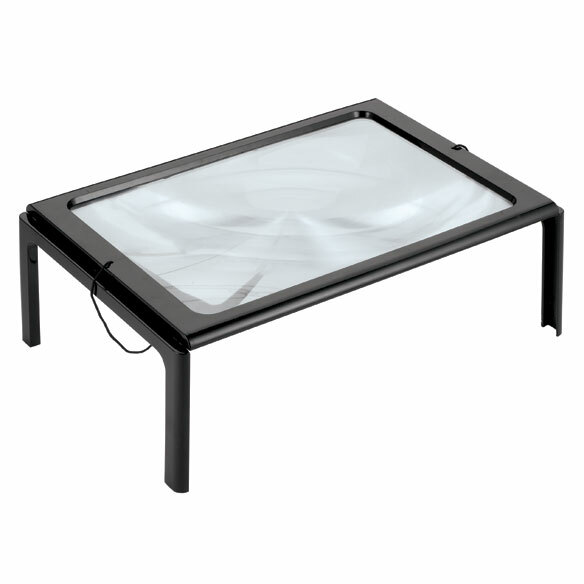 Stand magnifier is lightweight for easy portability. Ideal for reading, crafts and more. Screen magnifies 3X and measures 9 1/4"L x 6 1/2"W.
Measures 11"L x 8"W x 1"H overall. I love the magnifier I'm losing my sight so it helps a lot. I bought this for my father in-law, whose eye sight is extremely limited. The magnifier really does a wonderful job for him when he reads his mail and does sudokus. Got for 94 yr old client who has cataracts. She is thrilled that she can now read an entire page without having to move the magnifier. She leaves it on her side table with the legs up so it is easy to use. She is SO HAPPY! and so am I.
I teach Bible Study and need to readily see verse references..
My eye condition needs the lighted area to see plainly. It is great for reference books that normally have small type size. Can always use extre light and the magnification will be a welcomed addition. mother going blind...loves to read! BECAUSE WE ARE NOT ABLE TO SEE. my vision decline makes doing crafts harder. I don't want to give that up and thought to try this lighted, hands free magnifier. Hope it works! I do a lot of computer games as well as crosswords and cryptograms on paper. I think it will help. My wife ordered the magazine and she said she needed a magnifier. For my father with failing eye site. I work at a retirement home and we do book club. I need more light to read and I'm sure the magnification will help, too. I am having trouble reading receipes and other things, this will help. Need the extra magnification for larger items of close work. Because my father is legally blind and loves to play slots. Now he's had a stroke so I purchased a tablet and holder for him since he can no longer go to a casino. He can barely see what's on the tablet so I thought this magnifier would be perfect to help him see it better. I need this item for enlarging print because I do a lot of reading and research. My mother is having problems with her eyes and need something that will help her read and sew. I like the light and the feet to read map. An assistant to read small print. To be able to see .A person needs one when they don't have one.Like me. Is the screen of this item made of GLASS or PLASTIC ? BEST ANSWER: Thank you for your question. This item is made from plastic. We hope this information will be of help to you. BEST ANSWER: Thank you for your question. The battery case shows which way the batteries are supposed to be inserted. For the first battery place it in the case negative side first and then do the same with the second battery. With the side the battery case is on closest to you and starting from the right and working towards the left it would be negative/plus/negative/plus. We hope this information will be of help to you. There is a thin plastic cover partially covered by a leg when folded against frame. One review said that the light can be bothersome. Is it possible to use it without the light? I am considering purchasing this for my father. BEST ANSWER: Yes item can be use without the light option. But it is easier to see with light on. Works well either way. This item has an off/on switch. Do you have any stronger magnification available? BEST ANSWER: Thank you for your question. This would be the only strength we carry in this item. We hope this information will be of help to you. BEST ANSWER: Thank you for your question. The legs are sturdy and are able to be folded to lay the item flat. We hope this information will be of help to you. Will it work if you lay it flat on the page? BEST ANSWER: you're not going to get much magnification at all, the magnification comes from it being elevated or around your neck. No, you need to place it 4 inches above the paper. What is the approx life span hours of the batteries when the light is turned on? BEST ANSWER: Thank you for your question. The life time depends on how long you have the light on for. We hope this information will be of help to you.